Christmas without sugar cookies (the kind you roll and cutout and then decorate with icing) would be weird…I know that sounds dramatic, but it is the truth. With that in mind I decided to make a sugar cookie recipe for the holiday season. Divide chilled butter into four tablespoons (or into three tablespoons and one tablespoon). Cut the three tablespoons into pieces and put into a large bowl. Melt the other tablespoon of butter and pour into the bowl. Add maple syrup and maple sugar and continue to beat until incorporated. Add the vanilla and egg yolks to the bowl and continue to beat with the hand mixer until combined. Add salt and mix. A little at a time, add almond flour and beat with a hand mixer. Continue adding almond flour until it is all incorporated. Transfer dough to a piece of parchment paper and flatten into a disk. Wrap in plastic wrap and place in the refrigerator for an hour to one day. Preheat oven to 325° F and line a baking sheet with parchment paper. Once chilled all the way through, roll dough between two pieces of parchment paper until it is 1/4 inch thick. Cut into shapes and place onto baking sheet (optional: chill the cutout pieces again in the fridge to minimize spreading). Bake for 10 minutes (or until the edges are golden brown), rotating the pan halfway through. Decorate however you like. I used maple butter, which you can buy at Whole Foods, pistachios, chopped peppermint chocolate, and some freeze dried raspberries (for color). Grain-free cutout sugar cookies, perfect for Christmas. Divide chilled butter into four tablespoons (or into three tablespoons and one tablespoon). Cut the three tablespoons into pieces and put into a large bowl. Melt the other tablespoon of butter and pour into the bowl. Beat with a hand mixer until smooth. Add maple syrup and maple sugar and continue to beat until incorporated. Add the vanilla and egg yolks to the bowl and continue to beat with the hand mixer until combined. A little at a time, add almond flour and beat with a hand mixer. Continue adding almond flour until it is all incorporated. Preheat oven to 325° F and line a baking sheet with parchment paper. Once chilled all the way through, roll dough between two pieces of parchment paper until it is 1/4 inch thick. Cut into shapes and place onto baking sheet (optional: chill the cutout pieces again in the fridge to minimize spreading). Bake for 10 minutes (or until the edges are golden brown), rotating the pan halfway through. side note : Personally, I think it is important to use organic, local (when possible) chicken. I am not going to go much deeper into it but I just want to put it out there. If you are not into that idea that is totally fine, you do you… but if you are curious about organic vs. nonorganic I recommend googling it. In a small bowl (big enough for at least one chicken tender to fit comfortably), whisk eggs and set aside. In another bowl of the same size, combine almond flour, sesame seeds, salt, black pepper, celery salt, garlic powder, ground ginger, basil, and dried mustard. Set up a breading station : place the bowl of whisked eggs next to the bowl of the almond flour mixture. Next to that, place a baking sheet lined with parchment paper and brushed with olive oil. Dip one of the chicken tenders into the bowl of whisked eggs and wipe off any excess. Next, dip the egg coated chicken into the almond flour mixture, be sure to coat both sides evenly. Place the coated chicken tender onto baking sheet. Repeat this process with the remaining chicken tenders until they are all on the baking sheet. Bake for 10 minutes, flip, rotate pan and then bake for another 10 minutes (or until the temperature of the chicken reaches 165° F). 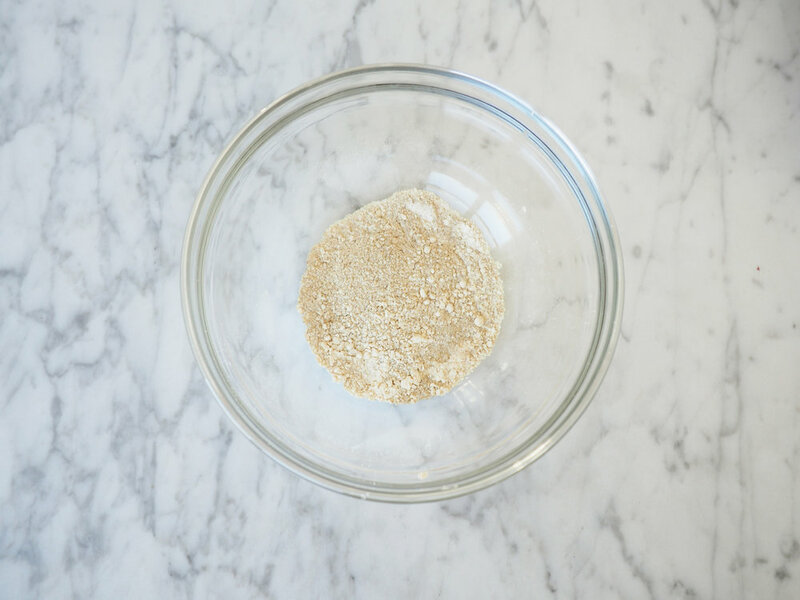 Set up a breading station: place the bowl of whisked eggs next to the bowl of the almond flour mixture. Next to the two bowls, place a baking sheet lined with parchment paper and brushed with olive oil. Next, dip the egg coated chicken into the almond flour mixture. Be sure to coat both sides evenly. Place coated chicken tender on the pan. Repeat steps 5-7 until all of the chicken tenders are coated and on the pan. Bake for 10 minutes, flip, rotate pan and then bake for another 10 minutes (or until the temperature of the chicken reaches 165° F). 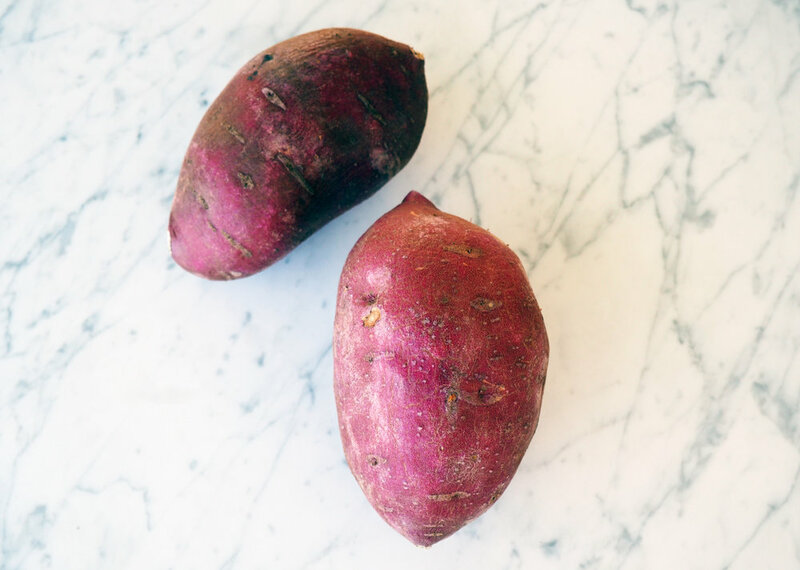 Up until recently, I did not like sweet potatoes or fries (I still do not like fries made with regular potatoes…I’m weird, I know). This all changed when Slow Magic and l went home to Vermont and my parents made us oven roasted Japanese sweet potatoes. I am not sure why I even tried them in the first place (usually I would have refused) but I am so happy I did because they have become a staple in our meals. Even though I am not big on regular fries, Slow Magic loves them so we set out to make some. After many burnt batches of fries (some were too thin… some we cooked too long) we finally figured it out. They are not only extremely easy to make, they are so so so good (even when they are cold the next day). Wash (scrub) and dry one or two Japanese sweet potatoes (depending on the size). Cut the potatoes into thick fry shaped slices. 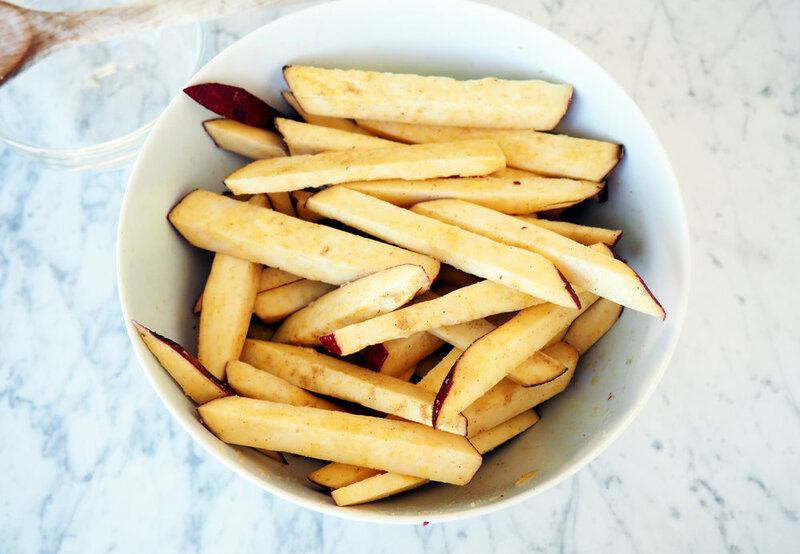 Place fries in bowl and drizzle with olive oil. Stir with a big wood spoon so that the fries are evenly coated. In a small bowl, mix together one teaspoon of salt, one teaspoon of pepper (I used white pepper but black works as well), and one teaspoon of garlic powder. Sprinkle the seasoning mixture over your fries and stir so that the fries are evenly coated. 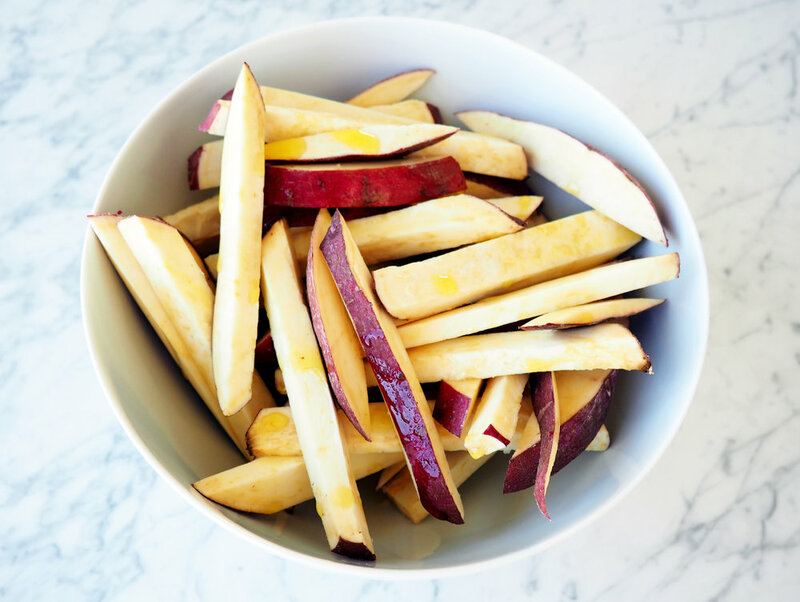 Evenly space your fries onto baking sheets lined with parchment paper and sprinkle with black sesame seeds. Bake for 15 minutes, flip, rotate pan (for even baking) and bake for another 15 minutes (or until golden brown). Place cut potatoes into a bowl and drizzle with olive oil. Stir with a spoon so that the potatoes are evenly covered. In a small bowl, mix together the salt, pepper, and garlic powder. Sprinkle over the fries and then stir with a spoon. 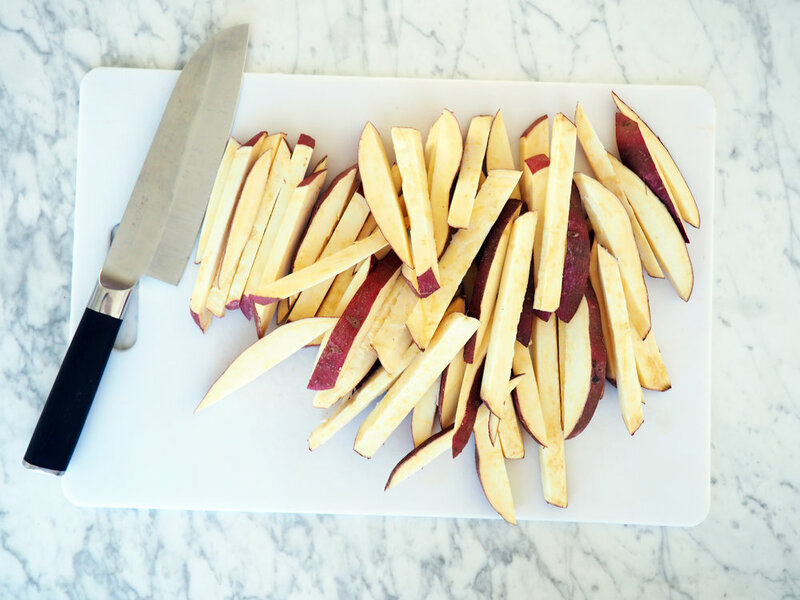 Evenly space fries out on baking sheets lined with parchment paper (make sure the fries are not overlapping). Bake fries for 15 minutes. Flip fries, rotate the pan, bake for another 15 minutes (or until golden brown).